Previously normal for commercial cider and wine makers the floating lid tank, or variable capacity tank, has become plastic, and so become affordable! This solves both the above problems at once. The moveable lid means that if you have a good harvest raise the lid, and if it’s poor lower it. The added benefit is that after the virulent primary ferment is finished, the lid can be lowered to get rid of the air. The seal around the rim of the lid is rather like a bicycle inner tube, and is pumped up with a special hand pump to the right pressure to get an airtight seal. The floating lid can be fitted with a special airlock (we strongly recommend) and a tap or hose at the bottom. (tube, pump, airlock and tap are available in our webshop). We can provide these fittings or you may already have your own. In any case we will be happy to answer any questions you may have on this exciting new product, which comes in a variety of sizes (from 50L to 200L). 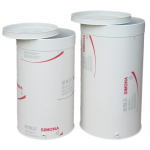 IMPORTANT: Prices include a dust lid, but not pump / tap / airlock / inflatable silicon tube. These are available under “ACCESSORIES” in our webshop.